The end of a very busy term is finally here. The students finished on Thursday with a very busy enrichment day. 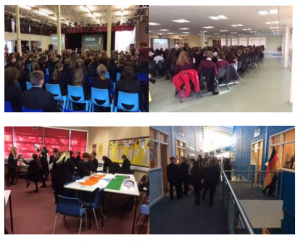 Year 7 had a focus around bullying, Year 8 had a crime and safety awareness day, Year 9 were looking at British Values, Year 10 had an amazing motivational speaker in and were looking at ways to manage stress and Year 11 were working in their option subjects. The sixth form had a variety of topics running through the day including looking at time management and university applications. I would like to send out a massive thank you to parents who are supporting our visitors from Melle. The band are playing with our students in several concerts in primary schools, the church and at John Port, as well as experiencing our culture. A huge thanks to Mrs Hodgson who has organised the exchange after only joining John Port in September. 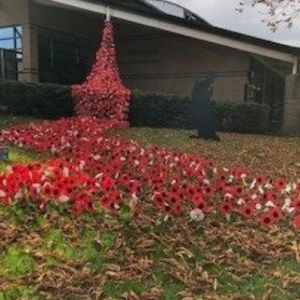 The students and staff have been preparing for remembrance day and we have a wonderful display of poppies on the side of Hathersage building. Phil Owen from Performance and volunteers have produced the cascade. There are also a number of life size silhouettes of army figures around the site. The names of the 34 men from Etwall who lost their lives in the First World War have their names in the display. I would like to remind parents that the SIMs Parents app will be in operation after half term. Staff will no longer use the planner to report behaviour issues as these will now appear on the app. I hope you all enjoy half term and we look forward to welcoming the students back on Monday 5th November.